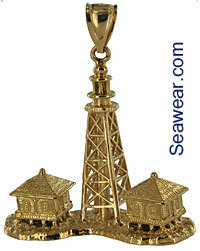 Lighthouse jewelry charms and necklaces of lighthouses of Florida in 14kt gold. 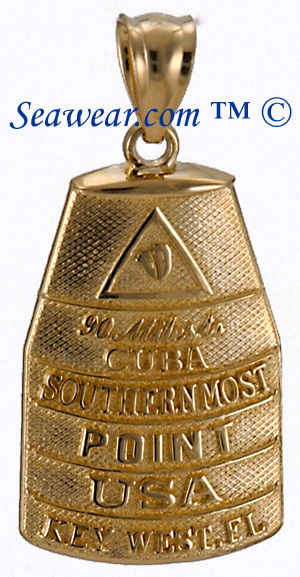 Other Florida lighthouse jewelry available would be Amelia Island lighthouse, Cape Canaveral lighthouse, Fort Jefferson (Dry Tortugas) lighthouse, Key West lighthouse, Pensacola lighthouse, Sanibel Island lighthouse and St. Augustine lighthouses, Mile Marker Zero and 90 Miles to Cuba Key West markers. 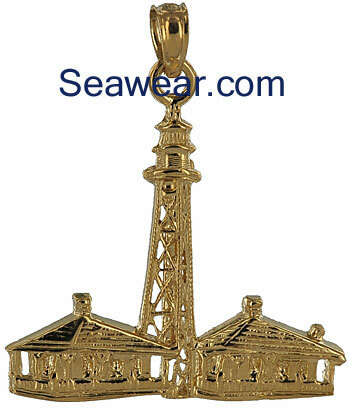 These jewelry charms and pendants are all 14kt gold and measured from the bottom to the top NOT including the loop and chain bail. 14k WHITE GOLD half round 2D Jupiter FL lighthouse. Back side is scooped out and polished. App 1 1/8" tall and 3.9gms. Premium white gold without rhodium plating necklace jewelry. 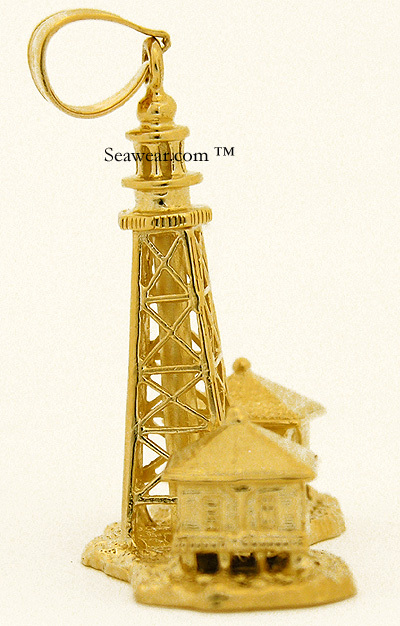 14k WHITE GOLD full round 3D Jupiter FL lighthouse. App 1 1/8" tall and 7.6gms. 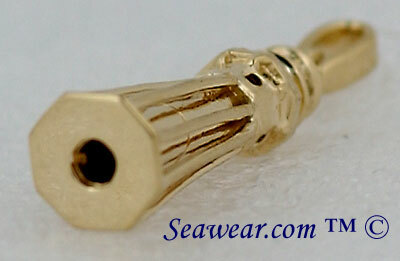 Premium white gold without rhodium plating. 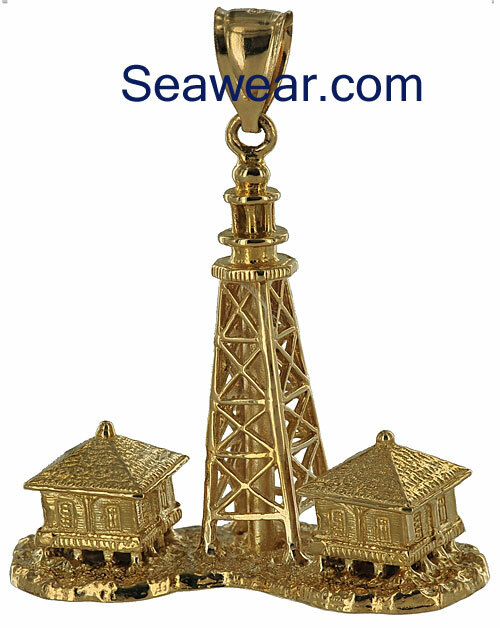 14kt Sanibel Island lighthouse and buildings pendant. Light, flat, finished on front app 1.9gms 7/8" tall and just under 1" across. Gasparilla Island Rear Range light lighthouse done in a 3/4 round version and not all the way around. Four sides of the pyramidal structure are showing. 1 1/8" or 28mm tall and app 5gms. 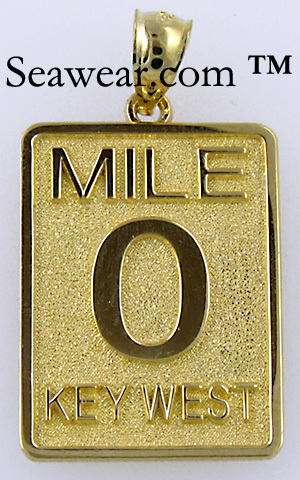 14kt Key West Mile Marker 0 zero charms! Large is 22/x16mm and app3.1gms; small is 14x10mm and app 1.3gms. Background is a bead blast texture finish while letters are raised and polished. If you've been there, now you can prove it!